The Barbican is a vast and ambitious development in the City of London. There are many exciting features including massed fountains, a cascade, roof gardens, trees growing on columns, great pools and a sitting area set below water level. However, many of the spaces are bleak and draughty. The development comprises tower blocks, a school, a major arts centre, part of London's Roman Wall and the restored St. Giles Church. Extensive pedestrian decks cover the parking areas and access roads. The scheme was designed by Chamberlain Powell and Bon in the 1950's and was complete by 1980. Visitors have always joked that it is almost impossible to find your way about. This has been countered by painting lines on the brick paviors. One can follow them, as Theseus did his unwound string. 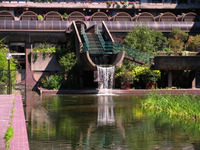 The best outdoor space at The Barbican is the large water garden. Like the New York's Rockefeller Center the space is enclosed on four sides and also at the corners. The Barbican is not, however, well-integrated with the city's pedestrian circulation. See essay on Bounded but unbound parks. Access from London Wall (egress more difficult! ).